Compatibility: Requires iOS 6.0 or later. 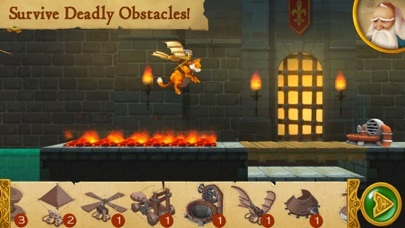 I love this game BUT you have yet to resolve the issue of the level 50 which has no solution. When you have addressed that problem, I will happily return to one of the most entertaining games I have ever played. Please fix this folks! I miss my play time with your game! And the fun cat! Well, after a break, I've returned to this great game and, after reading two reviews about level 50 having a solution, tried tried tried again! And to my happy surprise, there IS a solution to level 50!!! YEAH! Love this game! Well done! Well I figured out level 50. Apparently it isn't impossible! But now I finished the game. And I want more. However, compared to my other games, it takes WAY too much battery power. Need more levels! Keep those updates coming. My 7 year old and I both had so much fun playing this through to the end! (Yes, there is a solution to level 50.) 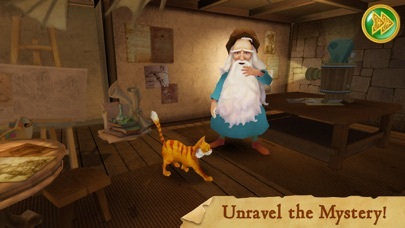 It is beautiful art, fun puzzles, and I love the cat's expressions. 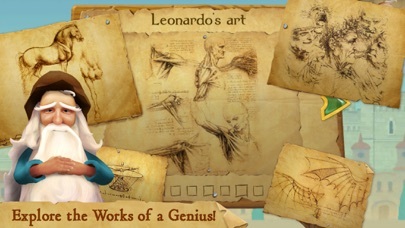 Educational in terms of problem-solving and a little history on Leonardo da Vinci. And, yes, I am a long fan of Patrick Stewart, too! Battery problem and lvl 50. Great game and has me completely hooked, and yet, compared to other games, it takes WAY too much of my battery. Also, level 50 is impossible. Keep it going!! Got this for my 7 year old. He’s completely hooked and loves figuring out the different ways to get the cat across. It’s such a cool thing to teach trial and error, debugging, and problem solving. As an adult, I even like it a lot! A great puzzler AND Patrick Stewart?!?! My 5 year boy loves this puzzler. 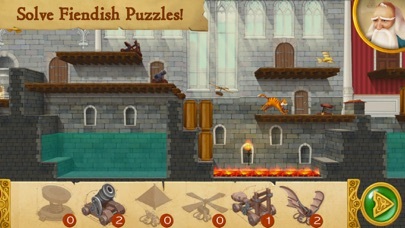 The music is great, the atmosphere is great, puzzles are straightforward and logical, perfect for someone young. I'm playing it separately and am finding it fun as well. I had high hopes for this, based on a family member seeing it written up. Alas, the sound doesn't work -- cute animation of Leonardo walking around and mouth moving for the intro, but without audio it's just no clear what to do. 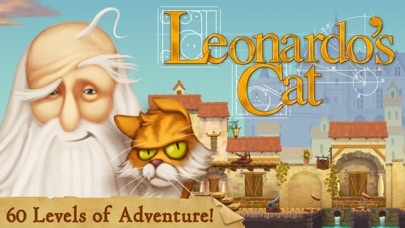 Story aside, this is an enjoyable game in which you aid the cat Scungili ("conches") through an obstacle course by placing a limited supply of devices (which even include a teleporter--Leonardo must have been more advanced than we realize) where they will be needed. It's offered as a kids' game,and adults may not find it challenging enough, but it's a pleasant puzzle for grownups too. I do find some of the things Scungili is put through unpleasant, but Leonardo (Patrick Stewart's voice) assures us he never suffers any serious harm. Multiple language options are included. I'm a grumpy old man (with an equally old and grumpy cat). This game is clever fun with excellent production values. Only at level 3 but enjoying the light, entertaining diversion. Highly recommended. I am an adult and I was enjoying this game very much until I got to level 50. I think there is something wrong, a bug or something. There is no way to get through it with no more inventions than given. I've tried everything. Please fix. I really like this game. Thanks. UPDATED:never mind, didn't know the drill went through concrete! Got it! Great game!!! Batman : Gotham’s Most Wanted! Farm 123 - Learn to count! Dino Dog ~ A Digging Adventure with Dinosaurs! Dino Dog - A Digging Adventure with Dinosaurs!